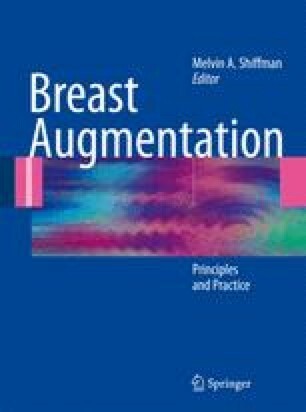 One of the most puzzling decisions in augmentation mammaplasty for aesthetic purposes or following mammary gland removal is related to adequacy of the volume of the prosthesis to be inserted. Most surgeons use a graduated gauge to measure the surface between the inframammary groove, the supramammary margin, the costoclavicular line, and the anterior axillary line. After determining the ideal space for the creation of a suitable pocket in which the prosthesis will be placed, the inflatable models of the prostheses are bilaterally inserted. The author suggests doing realistic intraoperative measurements of prosthetic size and shape. This “phantom” implant planning is a practical aid to appropriately and consistently select the final breast conformation in augmentation mammaplasty.